You are currently browsing the tag archive for the ‘Leon Schlesinger’ tag. ‘Cryin’ for the Carolines’ was the first of the so-called Spooney Melodies, a short-lived series, produced by Leon Schlesinger, using semi-abstract images set to organ music. Only five are known, and only this one has survived. The short features Milton Charles, ‘the singing organist’, singing and playing the sugary tune. Neil McGuire provides the classy, but static art deco art, e.g. of a sailing ship and a city skyline. There’s practically no animation involved, although there is some movement on the screen. The images have an avant-garde quality, but as almost nothing happens, the complete film fails to satisfy. Schlesinger followed the series with the much more successful Merrie Melodies. The dumb dog Willoughby was a minor Warner Brothers character, created by Tex Avery, and starring a few cartoons in the early 1940s. The dog kept changing names, and that’s probably one of the reasons he never got famous. ‘The Heckling Hare’ was his third cartoon, and in it he remains nameless. Tex Avery puts him against his much more famous creation, Bugs Bunny. Penned by Michael Maltese, the result is an inspired cartoon, full of gags. Willoughby swaps places with Elmer Fudd in hunting rabbits. He’s of course no more successful than Elmer, and Bugs tricks him a lot. The best scene is when Bugs makes the dumb dog making faces, while he puts forward a sign to the audience reading “Silly, isn’t he?”. However, the cartoon is most famous for its finale: for it ends with a lengthy fall from a cliff by both characters. This scene is obviously cut short in the final version. Producer Leon Schlesinger didn’t like the original ending, which apparently involved no less than two other falls, and ordered the cut. 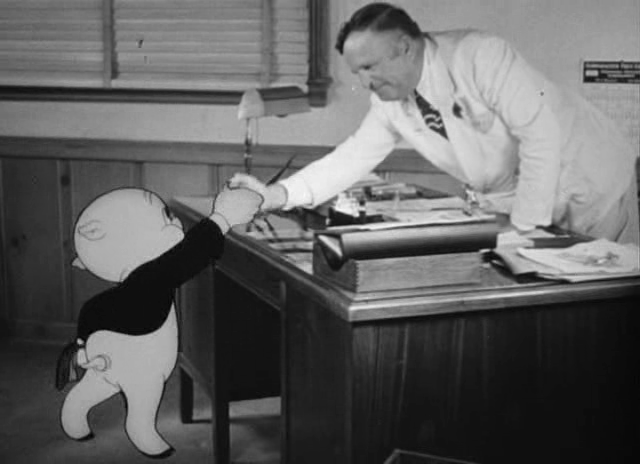 Rumors have it that this was the reason for Tex Avery to leave Warner Bros. This isn’t true. Tex Avery wanted to do a series combining live action animals with animated mouths. Schlesinger wasn’t interested, so Avery ended up doing this series, Christened ‘Speaking of the Animals’ at Paramount. However, this was not a success, and by September 1941 Schlesinger was making cartoons again, now at MGM, where he would direct his greatest shorts. In his book ‘Chuck Amuck’ Chuck Jones argues that ‘The Heckling Hare’ was the cartoon that re-established Bugs Bunny’s character, after three somewhat misguided cartoons by himself, Tex Avery and Friz Freleng. Bugs Bunny certainly is much more himself and in any of the previous cartoons. In any case, he would meet Willoughby again in the dog’s very last cartoon, ‘Hare Force’ (1944), directed by Friz Freleng, in which the dog is called ‘Sylvester’. ‘You Ought to Be in Pictures’ is the very first cartoon to bridge two ideas of animation film figures being ‘real’. First, the idea that cartoon figures can come alive from the drawing board into the real world, an idea that hauls all the way back to Max Fleischer’s first ‘Out of the Inkwell’ cartoons (1915). The second idea is that of cartoon figures being real Hollywood stars, explored in cartoons such as ‘Felix in Hollywood’ (1923), ‘Movie Mad‘ (1931), ‘Mickey’s Gala Premier‘ (1933) and especially ‘The Autograph Hound‘ (1939), with which ‘You Ought to Be in Pictures’ has most in common. ‘You Ought to Be in Pictures’ synthesizes these two ideas, making it a direct ancestor of ‘Who Framed Roger Rabbit‘ (1987). ‘You Ought to Be in Pictures’ was one of the first films director Friz Freleng made after his return from an ill-fortuned move to MGM, and as Jerry Beck points out in the audio commentary track, one can see this film somehow as autobiographical. In any case, this short marks is Freleng’s first take on Daffy Duck, and he places him firmly as Porky’s rival. In this cartoon Daffy is not necessarily zany, like in Tex Avery’s and Bob Clampett’s cartoons, but overconfident and sneaky, with a tendency to show off; character treats that would be explored more from 1950 on, especially by Chuck Jones. However, by then the relation between Porky and Daffy would be changed completely. In ‘You Ought to Be in Pictures’ Porky is still an innocent, cute and Boyish character. In the opening scene we watch him being drawn by animator Fred Jones on the drawing board. When all animators have rushed off to lunch (reused footage from a Leon Schlesinger Christmas Party film), Daffy, framed on the wall, addresses the Porky drawing. He convinces Porky to leave Leon Schlesinger’s studio to get a real job in the business of feature films. Leon Schlesinger lets Porky go, saying into the camera “he’ll be back!”. While Porky has a hard time in the neighboring live action studio, Daffy tries to get his plays at Warner Bros. But Porky returns and beats the hell out of the double-crosser. ‘You Ougt to Be in Pictures’ is a lovely cartoon. It mixes animation and live action, partly from other Warner Bros. features, to great effects. The scene in which Porky talks to Leon Schlesinger is very convincing, and Porky’s drive back no less than breathtaking. Besides Leon Schlesinger, the film stars writer Michael Maltese as a guard, animator Gerry Chiniquy as a director, and executive producer Henry Binder as a sound man. However, as the live action footage was shot silently, all are voiced by Mel Blanc, except for Leon Schlesinger who does his own voice.